Sir HughesAlot was knighted in 1492 after defeating the ever so large Ninja Dragon! Out of the office, back into the field! If anybody sent mail to Alex during the "lost transfer," it was probably sent to the most recent address you had, which is the Mission Office. So he likely would have received it eventually. But this new address is better. His birthday is December 15, and of course Christmas comes right after that. He comes home on February 26, so you can determine for yourselves how close to that date you want to send him anything. We probably won't send any more packages after the Birthday/Christmas package. The last mailed letter will probably need to be sent by about February 15. No guarantees that anything sent beyond that date will get to hime before he leaves. OK. So we are not doing our best when it comes to blog updates. About all we have done is notify you all of any address changes. I know, I know. "BOO! HISS! What kind of bloggers are you guys, anyway?" Sorry! Let us know you are out there. Comment on this, or any of the previous posts, and maybe that will spark some inspiration. Thanks! That's all for now. Take care! Stay tuned for more - very soon! His new companion is Elder Kirkpatrick from Gilbert, Arizona. They are already very busy teaching several investigators - mostly whole families - from Lebanon, Algeria, Russia, Moldovia, Brazil, China, Honduras, Mexico, the United States, Austrailia, Mozambique and Benin. It's kind of ironic that none of them are native French! 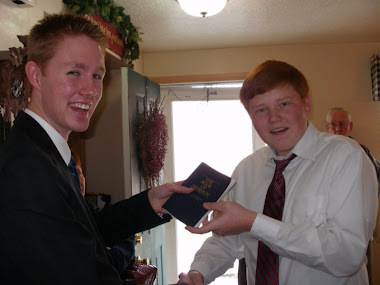 Alex has been serving in the Bordeaux area for the last two transfer dates with Elder Meservy as his companion. They have been busy teaching and have made many friends. Merry Christmas everyone! I am really excited to get to see your faces this week! We were lucky enough to get to talk to him for over an hour on Skype! This week was pretty much awesome! Preparation day was a little bit lame, but then Tuesday was super cool. We had three really good lessons before we went over to the Relief Society President's (Soeur Moukouri from Cameroon) house for dinner. Wednesday morning, we had to run over to the grocery store to buy some Bûches de Noël for zone conference!! It was definitely the best zone conference I've seen so far. Both the Bordeaux and Toulouse zones came and both sets of zone leaders did really well on their lessons. I found myself as the technician for the conference (a role I find myself in a lot) and took care of the projector and audio and everything. I also got to spend some time with President on the way to get the pizzas and figuring out all the food. We also did a gift exchage and some "unstructured activity" (as President put it). The gift I ended up with was some "holy water" from Lourdes, France. Apparently it's actually a super well known thing that thousands and thousands of people go to hoping to be healed of various things. haha. French people are so ridiculous. After zone conference we went and did some caroling in centreville with some of the other missionaries. It was pretty great! Oh and I almost forgot. When I was with President Murdock going to get pizzas and stuff, I found out that I'm the only missionary in the Bordeaux zone who is legal to drive a car in France. Apparently the church and the French government are cracking down on the fact that after one year of driving, a French or EU driver's license is required. So the mission is scrambling to find ways to take care of it but in the mean time, I really wish I knew how to drive stick! Thursday was my birthday! The Elders from Angoulême spent the night after exchanges and they made me a super awesome balloon hat! haha. 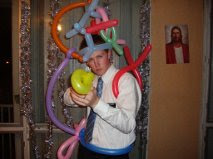 Sometimes it's sad how easily amused missionaries sometimes are. haha. Next awesome surprise: while we were on the way to district meeting, we got a call from the one and only ELDER ALLEN (Alex's former companion) saying that he was in Bordeaux for the day to take care of some legality. He came to district meeting and to district lunch and even came teaching with Elder Miller (exchanges) and I. Also during district meeting, the Soeurs of Lormont (Soeur Hallermeyer (French) and Soeur Bertolio (Swiss Italian)) made me a banana-choc-chip cake-type thing and a nice card. We also saw a few miracles with some of our amis throughout the day. Overall, it was definitely an amazing birthday. On Friday I experienced my very first tropical storm! haha. Granted we are an hour's train ride from the coast and I was indoors planning nearly the whole time, but it still was really cool to watch. Saturday we tried to do our Samedi Sportif ( recreation time) like usual, but the stupid weather outside was frightful, to say the least. As soon as we got home, we got a call from our ami Chantale that she would have to cancel our rendezvous. So we were feeling a little bit down in all the rain and cold and nothing-to-do-ness when we decided to pass one of our newer investigators named Kai and ended up having a great lesson with him, but when we invited him to do stuff, he was not at all interested. So back to a little bit down, we headed to the church for the ward christmas party. It definitely was more of a spectacle to be honest. The primary had set up an hour and a half long program of dancing and singing and videos and everything. It was intense! There were a TON of people that showed up too! At the end one of the families in our ward walked up to us and told us that Santa was coming a little early for missionaries and handed us each a huge bag full of food and chocolate and all sorts of good stuff. Both of us were pretty much speechless. I'll have to send a picture of all the stuff they sent us but wow. It was definitely a miracle. I love them so much! Sunday was also incredible! Even though a few of the people that we hoped would come to church didn't, there were FOUR investigators there. Definitely more than we've seen for a long while. After sacrament meeting, we did a split so we could each teach a few of our investigators with members. I was able to teach Claude Lerbscher with two of my favorite French members I've met so far, Didier Hoareau and Paul Picard. After we finally got out of the church, we stopped at home real quick before heading the the institute for a Young Adults raclette party we were invited to. Christmas time is flipping amazing! We see a New Year ahead of us. What an opportunity and blessing! The beginning of the transfer is also the beginning of the year 2012. So, take your "Missionary Planner" and plan not only your week, but also your year. Who will you be at the end of 2012? How can you improve as a missionary this year? What can you learn during the year? How much closer to the Lord can you become? What are the capacities (talents?) that you can aquire/improve during the year? Which bad habits to overcome? Which blessings to receive? Oh, life is beautiful when we follow the commandments of the living Lord. We are happy that the Lord has again given us a new year. We pray that he'll give us the faith and the hope and the strength to realize his hopes in our regard in 2012. We love our Heavenly Father and His plan, and his patience and goodness towards his children. God bless you in all your efforts to serve Him. Even though most of you aren't currently missionaries, I invite you to also take this invitation. You can either leave the missionary-specific parts intact and apply them anyway or you can replace these with the callings and responsibilities you have (either in the Church, at home or at work/school). I, also, am so grateful for a new year we have just ahead. I hope that I will be able to become a better missionary and a more devoted disciple of Jesus Christ. I know that because of the enabling power of the Atonement that I can and will do just that, become better. I know that you too can become better as we "burn bridges in all directions" having decided to follow the one true path, the gospel of Jesus Christ. Hello everyone! I am actually currently in Montpellier, France doing my emails. I have a three hour layover here before I take another train to Marseille! Once I get to Marseille, I will take another train for about ten minutes to Aix-en-Provence where I will be serving with Elder Kirkpatrick! He is from Gilbert , Arizona. I am SO excited to be going to Aix. Whenever people ask where I'm headed, they reply with a "ooh" or "you are way too lucky!" I truly am blessed to be taking what seems to be a tour of all the great and big cities of our mission. This is one of the only other cities that also has a center for young adults, which I've learned in both Lyon and Bordeaux is an giant blessing. I also have heard that the ward in Aix is magnificent and rather large also. While I am rather sad to be leaving Bordeaux and the amazing members and amis de l'église there, I am so excited to be starting a new transfer in a new ville and a new year! The train ride from Montpellier to Marseille was less comfortable and relaxing than the previous. From Bordeaux I actually got to ride first class, which is a luxury not many missionaries get to experience. The second train, however, was half an hour late from the beginning. Then, because it wasn't assigned seating and they apparently overbooked it, it took nearly a half an hour to get everyone on because there simply was not even close to enough room. We were seriously in there like sardines. Everybody was standing down all the aisles and everything not able to move for the whole two hour ride (which ended up really being close to 3 and a half hours of standing on the train with the delays and everything). Anyway, finally I got the Marseille gare about an hour and a half later than expected, meaning I had already missed my correspondance and the next one also. Luckily, as I started scalping for cell phones to call the mission office, I ran into Elder Turley who had been waiting in the gare for about two hours waiting for his companion who's train also hadn't yet arrived. Crazy, crazy exchanges. Anyway. I finally got to my tiny apartment in Aix en Provence with Elder Kirkpatrick last night. While the ride from Montpellier to Marseille wasn't exactly comfortable, the scenery and the countryside down in the south of France are absolutely gorgeous! It is SO stunning. Aix en Provence is also a very jolie ville. Il fait beau ici en plus! I'm super excited to be serving here! We will post his new address just as soon as we receive it. We are so excited for him and to hear about his experiences and challenges. We love having such a personal connection to missionary work. We continue to try and push ourselves outside of our comfort zone to share the happiness of the gospel. We hope this will encourage you to do the same. Hurrah for Israel! !